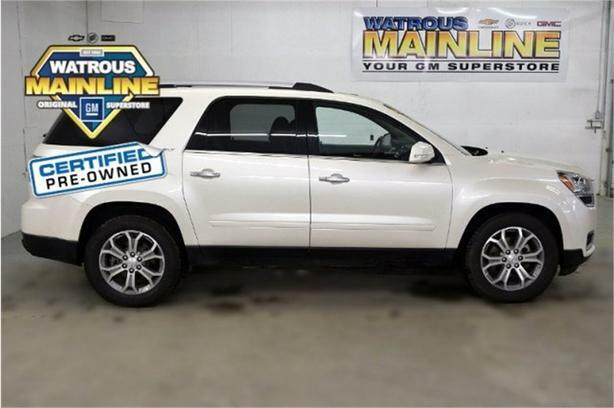 Look at this 2013 GMC Acadia SLT2. Its Automatic transmission and Gas V6 3.6L/217 engine will keep you going. This GMC Acadia has the following options: WHITE DIAMOND TRICOAT, TRANSMISSION, 6 SPEED, ELECTRONIC AUTOMATIC (STD), SUNROOF, DUAL SKYSCAPE WITH SLIDING FRONT AND FIXED REAR SECTION, SLT2 PREFERRED EQUIPMENT GROUP -inc: std equipment, SEATING, SEVEN PASSENGER SEAT CONFIGURATION (STD), ENGINE, 3.6L V6, DIRECT INJECTION (DI) -inc: variable valve timing (STD), ENGINE BLOCK HEATER, DARK CASHMERE, PERFORATED LEATHER SEAT TRIM, COLOUR TOUCH NAVIGATION SYSTEM -inc: colour touch AM/FM radio w/CD player, 6.5 diagonal touch-screen display, navigation system, and Windshield wipers and washers, front and rear, intermittent wipers with washers. See it for yourself at Watrous Mainline Motor Products Ltd, 208 1st Avenue East Box 70, Watrous, SK S0K 4T0.